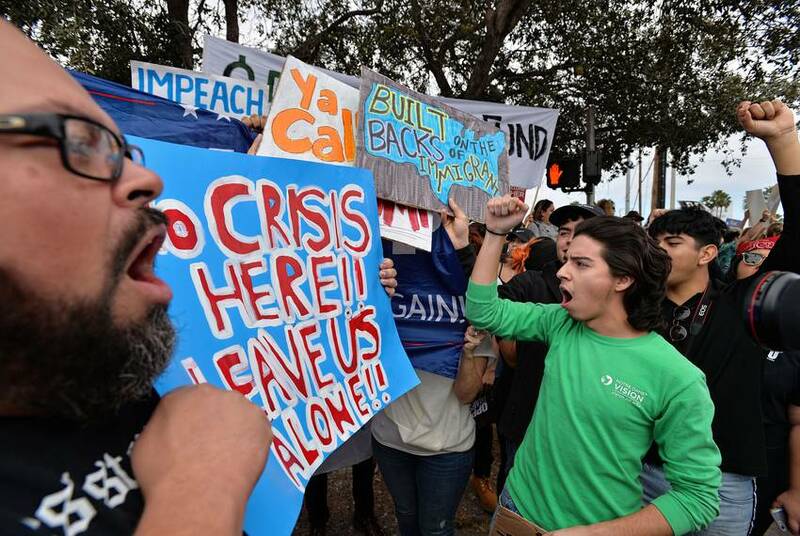 Amid signs, shouts and waving flags, a veteran says Trump's talk of the border as a war zone is overblown and an immigrant from Mexico says she supports the president's push to protect the border. McALLEN – Isidrio Leal knows what a combat zone looks like. And as he stood at the corner of 10th and Wichita streets Thursday holding a “Veterans for Peace” flag, the Iraq war veteran wanted one thing to be known: the border isn’t under siege. 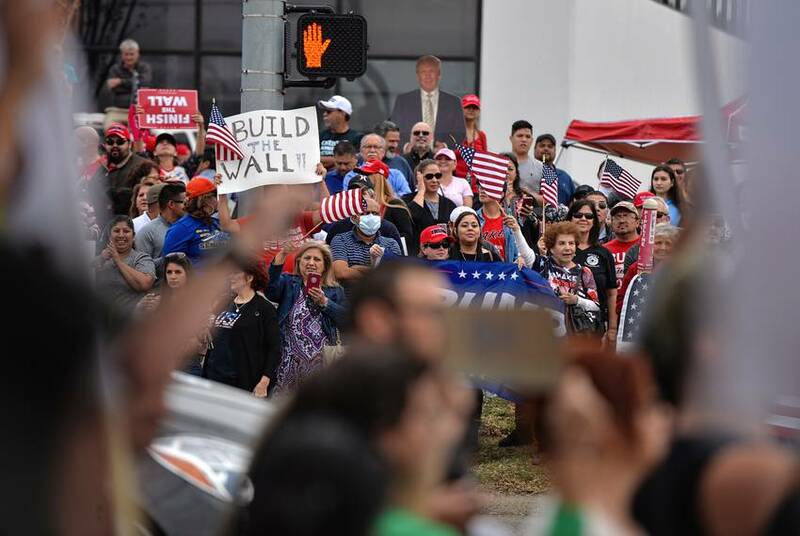 Leal was one of hundreds of protesters who lined the streets near the airport of this border city in anticipation of President Donald Trump’s brief visit. The border wall was one of Trump's signature campaign promises and he spent his time in the Rio Grande Valley making his argument for getting it funded and built. 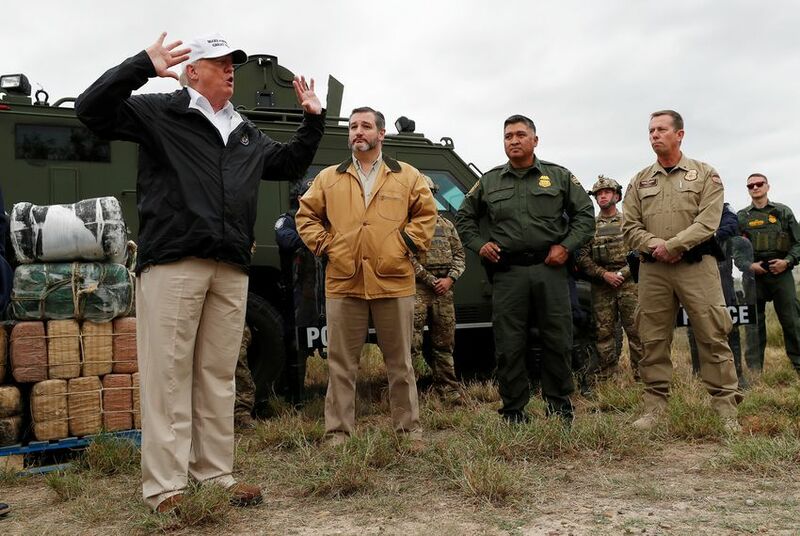 His visit included a stop at a Border Patrol station and a roundtable on border security with Department of Homeland Security Secretary Kirstjen Nielsen, Texas Republican U.S. Sens. Ted Cruz and John Cornyn, and Texas Lt. Gov. Dan Patrick. The president left Texas at about 4 p.m. local time. A stalemate between Trump and Congress over the barrier’s funding has led to a three-week government shutdown that has left hundreds of thousands of federal employees and contract workers out of work or working without pay. 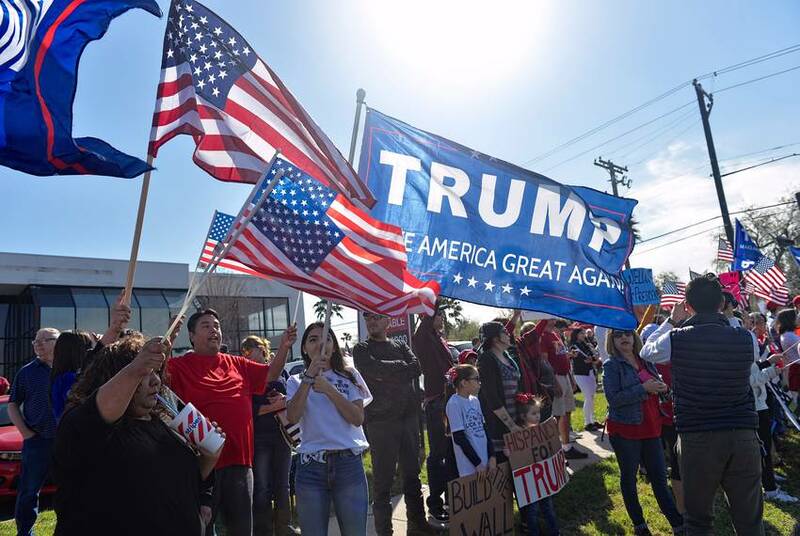 Across the street from Leal, more than a hundred of the president’s supporters held American flags and homemade signs praising Trump. Fabiola Gracia stood next to a cardboard cut-out of the president and said she fully supports Trump's efforts. Gracia, who is a legal permanent resident and says she is applying for U.S. citizenship, said she understands that some people are coming over the border to work. But she said that there is a legal way to do it — and she and her family are perfect examples. Gracia lived in Monterrey, Nuevo Leon before moving to Texas said she and her family would spend “endless days in lines” waiting for visas. “But the way they’re doing it, they’re promoting an unlawful entry into this country, which makes it illegal,” she said of undocumented immigrants. Trump warned that another migrant caravan — even bigger than the one that drew national attention as it made its way through Mexico last year before being stopped in the Mexican city of Tijuana — is forming in Honduras. He said the group won't be deterred by current measures like drones and motion sensors, "but you know what's going to stop in its tracks? A nice powerful wall." The president hinted that he's still willing to declare a national emergency and instruct the military to use its budget to build the border barrier — an idea that has made Democrats howl and has drawn opposition from even some fellow Republicans. "Either we're going to win or make a compromise," Trump told reporters. "I'm OK to making a compromise. Compromise is in my vocabulary, a very strong word. And so, we're either going to have a win, make a compromise because I think a compromise is a win for everybody or I will declare a national emergency." 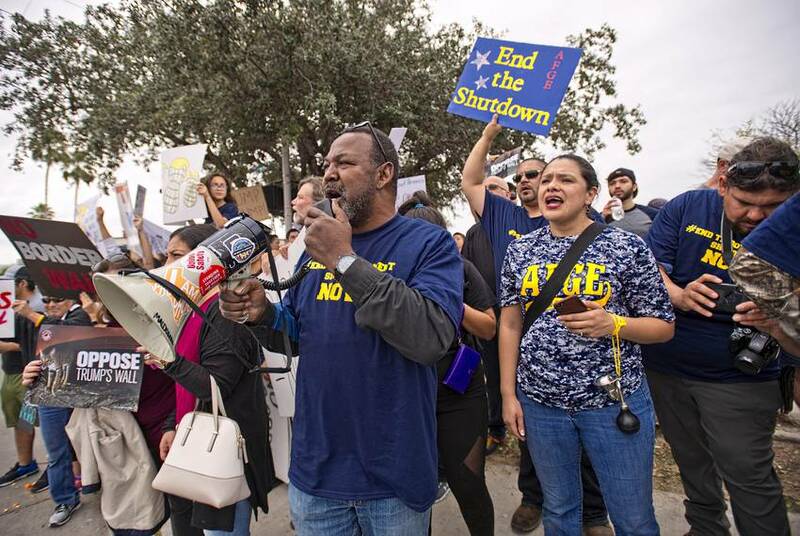 Thursday’s protest and counter-protests also featured furloughed federal workers who said they are caught in the middle of the immigration fight. Wearing his AFGE Local 3060 t-shirt, construction worker David Rodriguez, 42, said he's been furloughed because of the shutdown. He said he came to advocate for his fellow union members and for his three children, all of whom are younger than 10 years old. Trump, who abruptly walked out of a meeting with congressional leaders Wednesday aimed at negotiating an end to the shutdown, lashed out at Democrats, who he blamed for the impasse that led to the shutdown. "They could stop this problem in 15 minutes if they wanted to," he told reporters Thursday. "I really believe now that they don't want to. I really believe that they don't care about crime ... They've been taken over by a group of young people who, frankly, in some cases, I've been watching, I actually think they're crazy. But they've been taken over by a group that's so far left." Texas Democratic Party Chair and Rio Grande Valley resident Gilberto Hinojosa called Trump's Valley appearance “a political stunt. “Texans won’t sit idly by as Trump steals our land," Hinojosa said. "Texans and border communities must have a say in decisions that affect us. They are loud and clear: no one wants this wall and no one wants Trump’s shutdown. Patrick defended Trump and said it's time for his opponents "to put aside the partisan games and address this very real crisis. 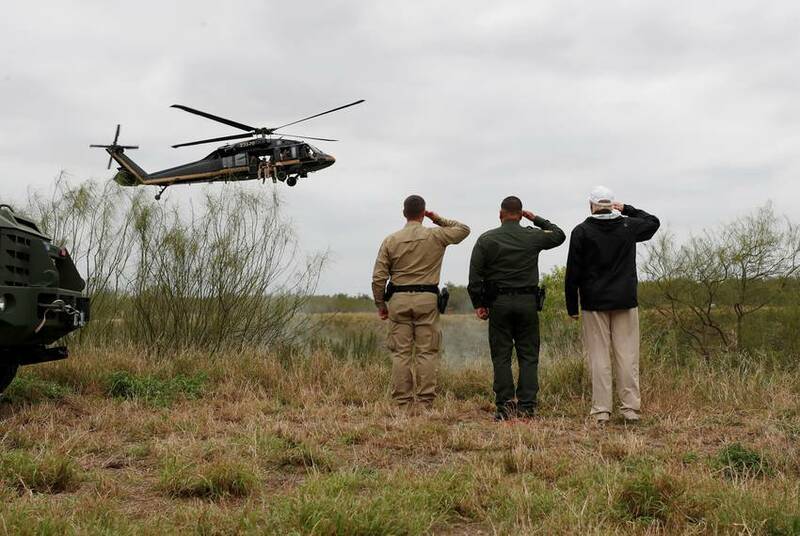 "The president's comprehensive plan to build a wall where it is needed, along with additional funding for narcotics detection, additional detention beds and additional immigration judges to handle the deluge of asylum applications and immigration cases, is critical to Texas and the country and Congress should act immediately to fund it," Patrick said in a written statement.